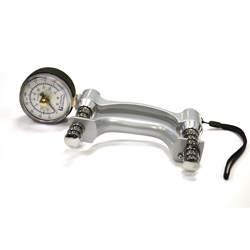 The Lafayette Hydraulic Hand Dynamometer is designed for both routine screening and for evaluation of hand trauma or diseased hands. The adjustable handle can be placed in five grip positions, from 1.375 in to 3.375 in, in half-inch increments. This sealed hydraulic system features a dual-scale readout that displays isometric grip force from 0 to 200 pounds (90 kg). Includes instructions, norms, patient record charts, and carrying case. Lafayette Instrument also calibrates the Lafayette (J00105) and JAMAR (5030J1) Hand Dynamometers. If you are interested in this service, check out our Calibration Return Form.